It’s in 1982 that everything begins. Back to when Serge Lachapelle was a professional in a multinational specialized in anesthesia equipment, something clicked for him. Why not use his expertise in the human field to refine veterinary equipment, adapt to their needs and maximize their performance? Here. It was enough for Dispomed to see the light of day. Building on its successes, Dispomed is rapidly expanding its horizons and developing new products. Our mission: offer high-end equipment ergonomically designed to facilitate your work and offer you comprehensive solutions. Since then, we have continued to surprise in the veterinary field with our innovative products, our service, our knowledge of the market and the expertise of our team. Today, Dispomed is increasingly recognized internationally. Whether in private veterinary clinics, research centers, zoos, the reputation of our family business is well established. Dispomed has carved out a place of choice on every continent. Moreover, many university faculties only preach by our products. Dispomed is THE reference from the University of Montreal to the University of Lyon, through those of Oregon, Kansas, Minnesota, Florida, and Toulouse, to name a few. 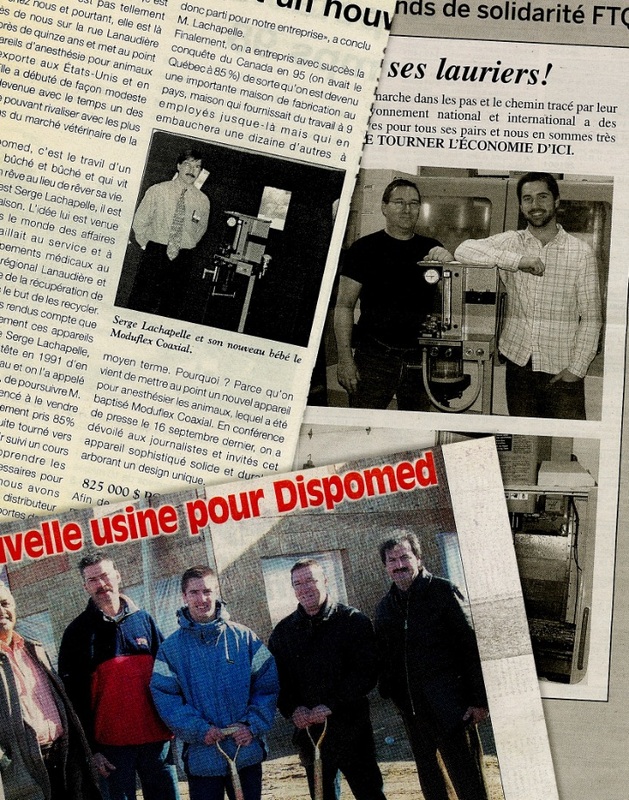 This reputation, Dispomed owes it to the attention paid to the quality of our veterinary equipment, which 90% of the components are manufactured at the Joliette plant. The close relationship with you, our customers, also allows us to develop products that are reliable, effective, durable and above all easy to use. Thanks to you, dear customers, who accompanied us in our first steps, Dispomed can now have an international reputation. Foundation of Dispo-med Limited by Serge Lachapelle. The company operates in the service sector of anesthesia equipment maintenance both veterinary and human. Veterinary anesthesia equipment accessories manufactured by Dispomed are created. The Bain circuit adapter and the Moduflex absorber are included. The first Moduflex device is created, this is the Optimax. Moreover, it is still working after more than twenty years. Dispomed holds 85% of the veterinary anesthesia market in Quebec. 60% of Dispomed’s revenue comes from sales made in France through Centravet. The Moduflex range expands with the arrival of the Coaxial. Dispomed is privileged to present the Moduflex line at the North American Veterinary Conference in the United States, surpassing 125 companies on the waiting list. 100 Moduflex anesthesia machines are sold per year in North America and Europe. Sébastien Lachapelle, Serge’s son, joins Dispomed and takes on several tasks such as shipping, assembly, and production. Dispomed moves to 745 Nazaire-Laurin, Joliette to double its production capacity. A new department is born: the implantation of the machining makes it possible to increase the efficiency of the company and increases the speed of production while facilitating the quality control. 10 employees are now part of the Dispomed team. Dispomed expands the range of products offered to veterinarians by integrating distributed products such as lamps, microscopes, and autoclaves. A new range of products manufactured by Dispomed is born: Vet-tables. Dispomed is now in Ontario with the arrival of two field representatives. Sébastien receives the title of vice-president in addition to leading the sales team and the production team. Highdent Trio and Quattro dentistry devices, the result of the latest family of products manufactured by Dispomed make their first appearance. The Bain circuit adapter has been the best-selling product at Dispomed for ten consecutive years. The Highdent Intro is born in response to requests from veterinarians for a more compact device. Dispomed sells more than 400 anesthesia machines a year! Mélissa Lachapelle, Serge’s daughter, joins Dispomed, taking charge of marketing as well as exporting. Dispomed now has 23 employees and is represented in 17 countries. A new distribution agreement allows Dispomed to distribute its products in 30 countries. Dispomed officially passes to the second generation of owners. Serge Lachapelle’s company is now taken under the wings of his two children Sébastien and Mélissa. The territory of Alberta is now served with a local employee. After an 8-month project, the new premises are finally ready. An 8000 square feet expansion is allowing us to double our production capacity. We now have 50 colleagues as part of Dispomed’s team. A new department is now open. The paint shop allows us to decrease our delays and gives us more flexibility when manufacturing your customized products. At Dispomed we are proud to manufacture quality veterinary equipment.